I believe the people who are speaking out against the cops are stating police signed up for a dangerous job, don’t use deadly force until you know damn sure deadly force is being used against you. That the leadership and people in power (cops/police) are not trustworthy, or are too trigger happy, or are too quick to react with violence – deadly violence. Regardless of where you stand (i think abuse of power should be punished more heavily than criminals, because these are people who work for the people and tax dollars pay for them to enforce the law – not be above it). There have been a number of videos surfacing of Police beating on people who are face down. IMO these people should be tried in a court of law, not a court of police. Of course, there is the other side of the story where cops die because of criminals every day, and better safe than sorry on the cop’s part. Now for the jump, bear with me. I see some similarities to the restaurant world in the way that discipline is handed down through the ranks. People only know one way of leadership – that is, yell at the employee/cook; motivate through intimidation and fear and yelling and throwing pots and pans everywhere. That’s how a lot of the top chefs came up through the ranks, and that is all they know. I know of and hear of a lot of chefs who are assholes or who have become assholes because their heads get big that they got some press in the local paper or were on TV. Similar to cops who think they are better than the people and can get away with anything and only know one way of enforcement. Every situation is different – every person is different. Being a good leader requires knowing who you’re dealing with – how to push and pull and use both positive and negative reinforcements. But I think just as some of the police force grew up in a certain culture; likewise, chefs and leaders in other positions – well it’s up to us as the new generation to treat the people better and rewrite and those who are in positions of power to use those positions and opportunities to spread good. 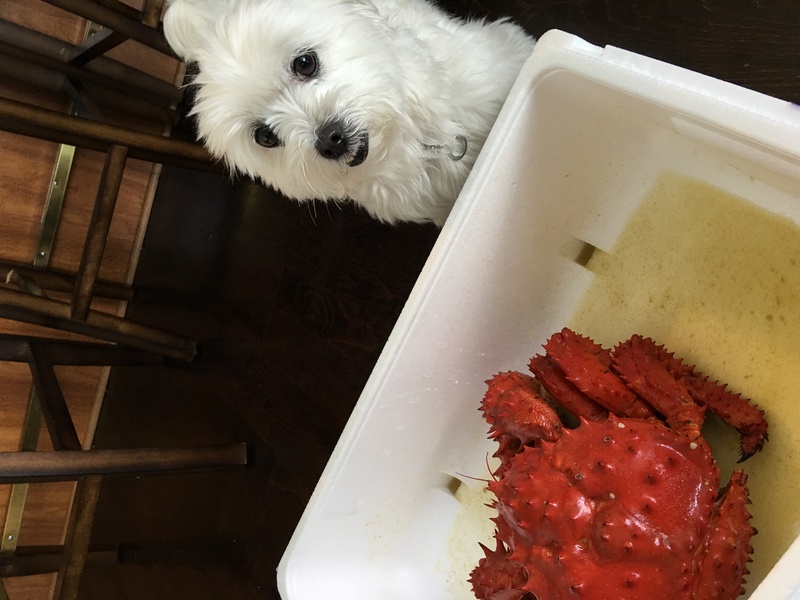 Here: the dog and the crab getting along. Not so eloquent, but I’m headed to a party to eat some Hanasaki crab and Wagyu, so peace out!